I've been Poppy selling door to door with the local Guide unit in the rain. I've made poppy bracelets with my Ranger unit. I've done a parade rehearsal for the Ranger Unit village parade. I paraded with our Rangers. 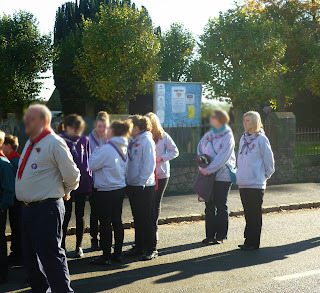 Every one of our girls was on parade with Guiding or Scouting somewhere this morning. Not a single one decided to stay in bed. For people this age, that's commitment. The sermon in this service was very interesting, history brought to life with letters from the trenches written by or about people on the memorial and letters written by prisoners of war. The children coloured in poppies with the names of the soldiers from the memorial written on them. The girls make me smile though, this is their 'at ease' waiting to be called to attention to parade back from church. Very at ease girls! Very! I paraded with the Brownies at my own village this afternoon. They had made poppies that they had written the soldiers names onto at the last meeting night. These were each put into a basket by the girls and taken to the alter with the collection. I hope it helped them to relate to the names on the memorial as people just a little better. The service at our village church is very formal and dry, but small steps to bringing a little more inclusion for the younger children are slowly being accepted. 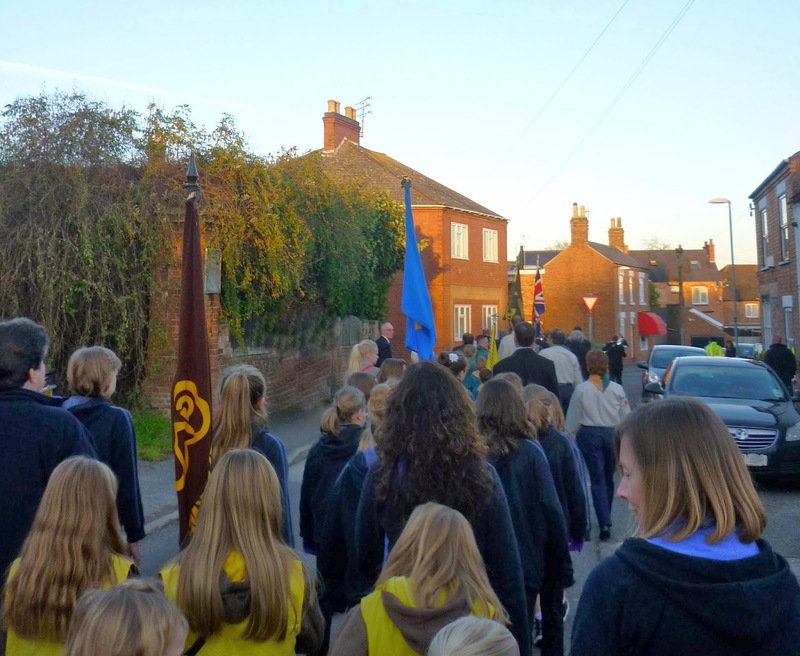 Remembrance parades in the villages are an important part of community life. It's the only one left in many, no more Empire Day fetes or Maypole dances but Remembrance is still there. Without the uniformed organisations making the effort and the wonderful local brass bands what would become of local Remembrance. It's just one more area where the volunteer members of Guiding and Scouting hold firm a keystone to community life and social responsibility.